A treasure in the palace inside the palace, just as an enormous matryoshka doll. 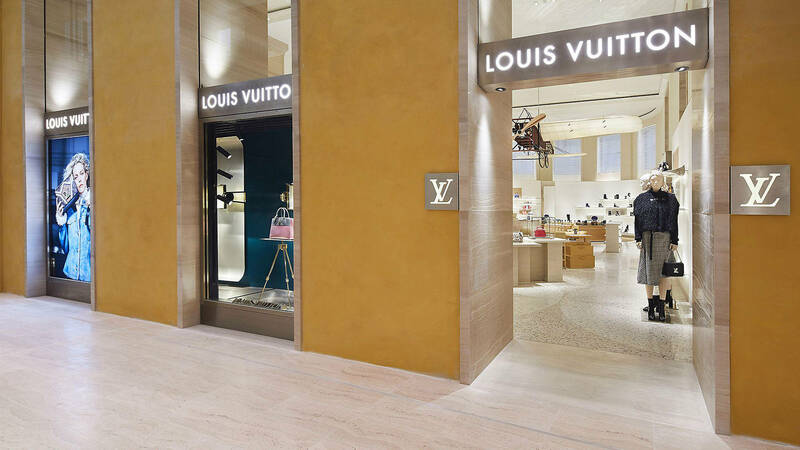 Louis Vuitton opened the doors of its third roman boutique, after the ones in Via Condotti and Piazza San Lorenzo in Lucina. The new store, situated inside the new Rinascente in Via del Tritone, represents an extraordinary location, marked by the flow of time and the succession of ages. The boutique develops within an early 20th century building called “palazzetto”, which is located in the heart of the main construction, and stands on the remains of one of the aqueducts that used to quench Rome and that still stokes the fountains of the historic center. The façade of the ancient palace, painted with a warm shade of roman yellow and covered in travertine, is an open invitation to discover what you are going to find inside. Here, the visitor’s attention is right away captured by the scale reproduction of a monoplane from the early 1900s, hanging from the ceiling, as well as by the majesty and brightness of the space. In the boutique you can feel a rarefied atmosphere, everything is dissolved in the thousands nuances of beige. What stands out amongst the flooring in fine Venetian terrazzo, with the iconic monogram motif, the monumental pillars and the walls in cream stucco are the accessories, the leather goods, the travel goods, the jewelery and the frangrances offered by the brand, the actual treasure. Besides the new trolley “Horizon” designed by Marc Newson and an exclusive midnight blue version of the “Star Trail ankle boot”, the boutique hosts “My World Tour”, the new collection of travel accessories, which can be customized with lettering and stickers inspired by the collection of more than three thousand original labels from the greatest hotels of the world, that once belonged to Gaston Vuitton, grandson of Louis, and which are still kept in the archives of the Maison. The customization is available only on some iconic styles of the Maison, like for example the Speedy and Neverfull bags, the Keepall travel bag and the Horizon trolley, thanks to a special silkscreen technique which allows to print the labels directly on the original canvas, Monogram or Damier Graphite. Louis Vuitton created five labels : LV Heritage, Cities, LV Pop, Grand Hotels and Make it your own. The last one, Make it your own, allows clients to customize their My World Tour items with letters and meaningful dates, making them unique.